It is snowing here in Shropshire and I guess it’s Snowing now in Aspen Colorado. I guess I never will make it to the kitchen of Owl farm now. 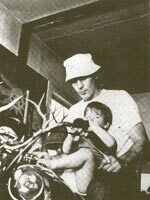 Hunter Stockton Thompson was a friend to me although we only ever met on the page. By saying, ‘only’ I don’t mean to devalue those meetings. I’ve felt closer to HST and other people through their work-people I’ve ‘never met’ than I have to most of the people I’ve worked with. This then is the magic of language, writing and the written word. I was first given the then current paperback edition of ‘Fear and loathing in Las Vegas’ in late 1993 by a girl I was falling with. She suggested me reading it and that if I couldn’t get a record deal, we both go on a road trip across the States. Anyway. I loved the book; it really was unlike anything else I had read at that point. It had a musicality to it and a strangely modern cinematic style. (Hunter was an exquisite stylist). I couldn’t be sure as to when it was written –it seemed weirdly futuristic-and although I had done more than enough Acid at that point, most of the other drug references held little personal resonance for me. So, like every other excitable early twenty something, I tried to include the phrase ‘As your attorney I advise you…’ into every conversation for a few weeks and moved on. A couple of years later, having exhausted Camden’s compendium bookshop of Bukowski, Fante and Celine, I bought ‘The great Shark hunt’. I was put off initially by the ‘political’ thing but soon realised this was a misnomer. What engaged me in Hunter’s writing was his sense of Spirit and life. Politics schmoliticks. He could have been writing about fly-fishing, it was almost irrelevant. This collection, like all the greatest Anthologies, is patchy but is again full of music, magic and Fire and I was now becoming addicted. I began to look out for his first editions, magazine features for Interviews here and there in the broadsheets. I wondered why he didn’t appear on UK TV more often if at all. I couldn’t quite work out how old he was, either. And the way he dressed- it was if he were wearing an outfit or a uniform of some kind. Even the way he talked seemed to be in a dialect of his own composing. Yeah, like all the true greats, he was a universe unto himself. Anna and I having our first big row after watching ‘Fear and loathing’ at Screen on the Green in Baker street. (I remember that few Cinemas’ in London showed this movie when it came out). Me reading an account of one of his ill fated visits to Britain in the 80’s. I was enduring a few weeks of being homeless and hung out in libraries a lot. At Euston library, I read this piece in ‘Arena’ magazine. Sometime late 1998 I think? Helena Christiansen was on the cover and I’ve never seen this essay anywhere else since. It was wonderful, evoking Hunter’s character and presence vividly. (Hunter made me re evaluate my prejudice against ‘Fun’). It was immensely cheering and broadened my horizons while just sitting there. I new there was a lot more fun to be had. I was right. The Christmas of 1999 saw us in a nice East London flat, still giddy from an unexpected Royalty cheque. To celebrate that festive season, I splurged on books, presents, and a lot of Coke. Amongst the presents Anna got me that year was ‘The Rum Diary’. I’ll forever equate that fine, fine book with that Happy Christmas, a Christmas of Righteous joy and intoxication. Then there’s Anna again, in a west end restaurant, handing me the mid 2000 edition of ‘The Paris review’. Hunter on the cover as the Dalai Lama by Ralph Steadman. (And hey-Ralph- Hunter’s straight man -is Welsh)! So it went. Listen to ‘Dalston interlude’ on my last LP, ‘neu York’. That’s a cheap tape recording of me and my chums, chugging, toking and snorting while we try and watch the best worst film ever; ‘Where the buffalo Roam’. ‘The proud highway’ was the first book of letters I ever read. It was this insight to his pre-gonzo life that drew me to the conclusion that the Gun and Drug stuff was mostly armour of Hunter’s own construction. On finishing ‘Proud Highway’, I sent Hunter a vinyl copy of the second Jack Album. I figured I was writing to the young man I’d just read about-because anyway, Hunter did seem oddly ageless to me. This record ‘The Jazz age’ has a touch of Fitzgerald about it; I figured he might dig it. In bold thick Pen I scrawled; ‘For hunter. Your sensitivity astounds me’. I reasoned that if I wrote his name, Owl farm, Woody Creek, Aspen Colorado, U.S.A. on the envelope, then that would be enough. I may also have included my fax number. I never did hear back and didn’t count on doing so. ‘I knew that if I could just get back to owl farm, everything would be alright’. Hunter was my spirit guide. Hunter was my kind of American. Back at our Owl farm, I guess we’ve tried to watch the ‘Fear and loathing’ DVD at least ten times. The Criterion collection version is really something but we still can’t get through it without getting smashed. I have a collection of Hunter’s US chat show appearances, too. His final appearance on Conan O Brien is a masterclass in comic timing. Conan is as nasty and sharp as mainstream US TV hosts go. In this his final appearance, Hunter beats Conan like a gong. I continued to buy and read everything religiously, gobbling up the final collections greedily, logging onto ESPN when I remembered to. Sports schmorts. At the core was the immortal Roe-Buck Steer spirit of Hunter. Hang Sports or Politics on his antlers, it was still Thompson underneath. Wayne enjoyed the review so much he got in touch to tell me so, saying that Hunter had enjoyed it too. He ended by saying that if I was ever in Aspen, I should let them know and he’d try to arrange a meeting. If I was ever in Aspen. There being the rub. I wasn’t prepared nor could afford to fly out on this shaky premise but I was sure that the next time I visited the states I could take a detour. And what was the rush? Hell-Henry miller lived until his nineties and Thompson was only now in his sixties. If he hadn’t succumbed by now, then I guessed he was in for the wise old haul. Yesterday morning I lay awaking to BBC Radio 4. At the mention of Hunter’s name, my sleepy ears perked up. My whole day was waylaid by grief for a dude I’d never met, let alone got drunk or snorted Gack with. The purity of our connection was limited to the otherworldly dimension of the printed page. On waking today, everything is different while the same. The light is weird and the music far off. Hunter is gone from here and to paraphrase Bill Hicks; ‘I just felt the world get heavier’. Gravity on planet earth just got stronger. I had continued to send hunter Stockton Thompson my records. The last one was ‘The end of the way it’s always been’. “And each familiar face in the evening news obituary is just the baby teeth in the smile/on the face of this new Centaury’. (As if enough information on his death would bring him back). Like Martin Amis said; suicide is about the victim cancelling the world, not the other way round. There is something eerily correct about Hunter Checking out in this manner. Something sadly noble, in keeping with his basic courteous character. “It hurts when you’re wrong and it hurts when you’re right. But it hurts a lot less when you’re right’. Nah, I don’t get it either but there’s a kind of bitter logic in it. I raise triple Mount Gay Rum to you my friend; it’s suddenly gotten very heavy in here.